LUKE (Chapter 23) - The seven blood steps of Jesus Christ, which let to the fulfillment of His sacrifice on the cross of Calvary. Jesus before Pilate, as His (earthly) judge. 23 verse 1-7: "And the whole multitude of them arose, and led him unto Pilate. And they began to accuse him, saying, We found this fellow perverting the nation, and forbidding to give tribute to Caesar, saying that he himself is Christ a King. And Pilate asked him, saying, Art thou the King of the Jews? And he answered him and said, Thou sayest it. Then said Pilate to the chief priests and to the people, I find no fault in this man. And they were the more fierce, saying, He stirreth up the people, teaching throughout all Jewry, beginning from Galilee to this place. When Pilate heard of Galilee, he asked whether the man were a Galilaean. And as soon as he knew that he belonged unto Herod's jurisdiction, he sent him to Herod, who himself also was at Jerusalem at that time." The accusing crowd of chief priests, elders and scribes – with a growing number of followers among the disappointed people; disappointed, because this Messiah did not meet their expectations of divine invincibility – led the captive and shackled Jesus to the Roman judge Pontius Pilate, who was also the representative of Rome. Their (false) accusation was that Jesus would have forbidden to pay taxes to the emperor, and with this they stirred up the people against Him. But their main accusation was that He called Himself Christ, the King. And whoever called himself king, rebelled against the emperor of Rome. Therefore Pilate questioned Him on this point. But Pilate understood all too well – because Jesus Christ did not act in secret, and Pilate must have known of the sermons of this Man – that the issue was a religious conflict among the Jews themselves, and that they had handed Him over to the judge out of spite and jealousy. That therefore was the reason Pilate wanted to release Him, saying: "I find no fault in this Man!" When Pilate, however, heard that Jesus was born in Galilee, he thought to be rid of this "dirty matter" by sending Jesus on to the judge over that area, namely king Herod, who "happened to be" at Jerusalem. Jesus handed over to the curiosity and the mockery of Herod. 23 verse 8-12: "And when Herod saw Jesus, he was exceeding glad: for he was desirous to see him of a long season, because he had heard many things of him; and he hoped to have seen some miracle done by him. Then he questioned with him in many words; but he answered him nothing. An the chief priests and scribes stood and vehemently accused him. And Herod with his men of war set him at nought, and mocked him, and arrayed him in a gorgeous robe, and sent him again to Pilate. And the same day Pilate and Herod were made friends together: for before they were at enmity between themselves." Herod hoped to be surprised by Jesus with a "show" of His power. Therefore he was glad, when Jesus was handed over to him. He had heard so much about His wonderful power, and even thought that He might be John the Baptist, who was brought back to life by God (see Matthew 14:1-2). Because of his curiosity he spoke much with Jesus, and asked Him many questions, but the Lord Jesus did not answer him by a single word. Therefore Herod became angry and mocked Jesus, together with his soldiers. He also showed Jesus his contempt by putting a shining purple garment on Him (Mark 15:20 and John 19:2). After that he sent Jesus away, back to Pilate. Yet Pilate's action by sending Jesus to him, pleased Herod. Was there enmity between them at first, from that time on they were friendly. 23 verse 13-25: "And Pilate, when he had called together the chief priests and the rulers and the people, Said unto them, Ye have brought this man unto me, as one that perverteth the people: and, behold, I, having examined him before you, have found no fault in this man touching those things whereof ye accuse him: No, nor yet Herod: for I sent you to him; and, lo, nothing worthy of death is done unto him. I will therefore chastise him, and release him. (For of necessity he must release one prisoner unto them at the Passover feast.) And they cried out all at once, saying, Away with this man, and release unto us Barabbas: (Who for a certain sedition made in the city, and for murder, was cast into prison.) Pilate therefore, willing to release Jesus, spake again to them. 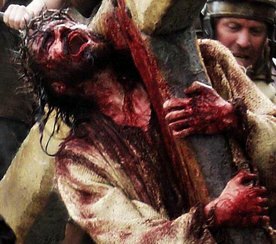 But they cried, saying, Crucify him, crucify him. And he said unto them the third time, Why, what evil hath he done; I have found no cause of death in him: I will therefore chastise him, and let him go. And they were instant with loud voices, requiring that he might be crucified. And the voices of them and of the chief priests prevailed. And Pilate gave sentence that it should be as they required. And he released unto them him that for sedition and murder was cast into prison, whom they had desired; but he delivered Jesus to their will." Pilate wanted to release Jesus, because he found Him not guilty. And because it was the custom that a prisoner received remittance for punishment during the Passover feast (i.e. the memorial festival of Israel's exodus from Egypt by God's hand, whereby the Passover lamb was slaughtered), Pilate therefore tried to release Jesus at the Passover. Pilate therefore asked the people: "Whom will ye that I release unto you? Barabbas, or Jesus which is called Christ?" despite the fact that he knew they had handed over Jesus because of spit and jealousy (see Matthew 27:17-18). But the people, stirred up by the chief priest and rulers of the people, demanded increasingly violently His crucifixion (and thus the release of Bar-Abbas). CLICK HERE if you want to read this study (Chapter 23) – that is to long for the Blog.